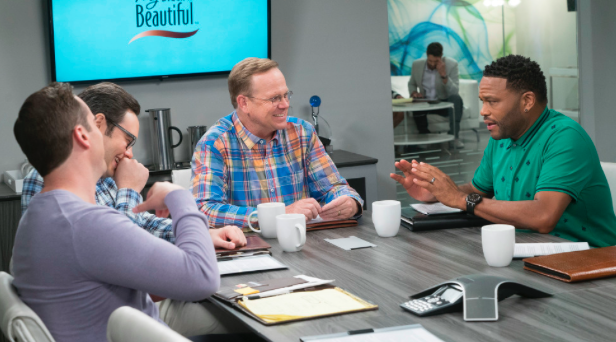 Full disclosure: The hardtracking staff has never watched blackish, but we certainly understand the accolades the show has received for its adroit “unpacking of hard topics with humor and nuance,” as the PBS NewsHour put it. Even so, we thought Brian Steinberg’s report yesterday in Variety was kind of . . . whack-ish. Procter & Gamble makes products like Tide and the Swiffer that help consumers clean up their homes. Now the large advertiser is paying ABC to polish the plotline on one of its most popular sitcoms. 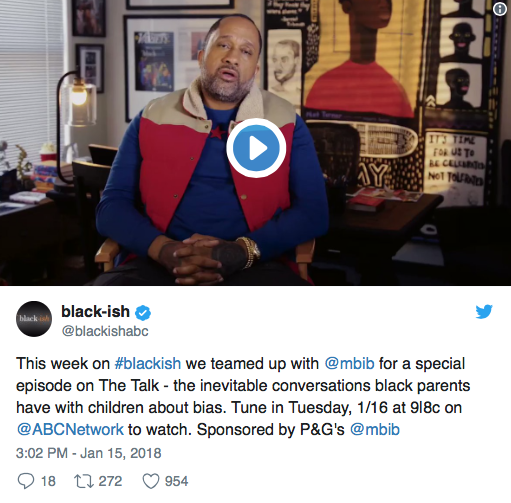 In a unique advertising pact, the characters in “black-ish” will talk about a two-minute film Procter & Gamble released last year to spotlight the discussions black parents have with their children to prepare them for racial bias. The short film, “The Talk,” sparked debate when it debuted in July of 2017, and is emblematic of how major marketers are embracing causes and trends in an effort to align with consumers who have grown increasingly resistant to traditional commercials that shovel sales talk into lives that are already busy. Well, something’s being shoveled, that’s for sure. While Variety has P&G “buying” dialogue and plot on the show, The Grio’s Demetria Irwin has black-ish “partnering” with My Black Is Beautiful, a group that describes itself as ”created in 2007 by a group of visionary black women at P&G to spark a broader dialogue about black beauty.” But the Grio piece skips the P&G part. The show’s Twitter feed, however, does. Regardless, Jay Rigdon at The Comeback has serious reservations about the whole thing. Product placement is fine in its – well – place, he writes, but that doesn’t include letting marketers coopt entire programs. Writing an entire storyline around a paid-for plot point is borderline. Even though the overall goal for Proctor & Gamble is noble on the surface, it’s hard to see how a brand inserting itself to this degree into what is, in theory, art will end well. You can see for yourself tonight. Let’s hope it’s not brack-ish.